Follow these steps to prepare for your first 5K or 10K. Even for seasoned racers, the days before a race can be stressful. With all the hope and hard work that you’ve invested in your goal event, you want to arrive at the starting line feeling calm, healthy, and ready to run your best. Here are a few reminders to keep you on track in the critical days and hours before the starting gun fires, and to help you recover after you cross the finish line. Stop stressing. 5Ks and 10Ks are hugely positive community events. You get to spend a morning with strangers cheering you on, feeding you and offering water, and celebrating doing something healthy for yourself. Everyone fears that they’ll be last, but don’t worry. In all likelihood, you won’t be. People with a very wide range of abilities and levels of fitness do 5Ks, and many people just go to walk them from start to finish. Cover the route beforehand. If you can, work out on the route where the race will take place so you can get familiar with where you’ll need to push and where you can cruise. Finding the race start beforehand will prevent you from getting lost on race morning! Eat what works for you. Your best bet is to eat whatever has worked best for you—that’s given you a boost without upsetting your stomach—during your regular weekday runs. Don’t eat anything heavy within two hours of the race. A smoothie containing fruit and yogurt is always a good choice because it gives you a good balance of carbs and protein but not too much fiber (which could cause GI distress). Get ready the night before. Lay out your gear and get as much sleep as possible- aim for eight hours. Don’t do anything new. Race week isn’t the time to try new shoes, new food or drinks, new gear, or anything else you haven’t used on several workouts. Stick with the routine that works for you. Get off your feet. In the days before you race, try to stay off your feet as much as possible. Relax, and leave the lawn mowing or shopping or sightseeing for after the race. Graze, don’t chow down. Rather than devouring a gigantic bowl of pasta the night before the race, which could upset your stomach, try eating carbs in small increments throughout the day before the race. Put your hands on your bib. 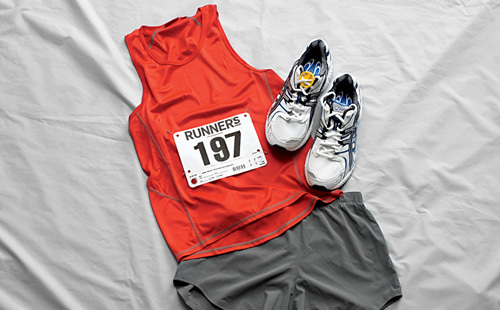 The night before the race, lay out your clothes, and if you have your bib, fasten it on. That’s the one thing you need at the starting line. Don’t show up without it! Limit your sipping. Yes, you need to stay hydrated, but no major drinking 30 minutes before the gun; sip if your mouth is dry or it’s particularly hot out. Some athletes will take a mouthful and use it as a rinse and spit. Your best bet is to stay hydrated throughout the day. Aim for half your body weight in ounces. So for instance, if you weigh 200 pounds, aim for 100 ounces of calorie-free fluids like water each day. If you weigh 160 pounds, aim for 80 ounces per day. Arrive early. Get to the race at least one hour before the start so you’ll have time to pick up your number (if you don’t already have it), use the porta potty, and warm up. You don’t want to be running to the starting line. Identify yourself. Put your name, address, cell phone number, bib number, and e-mail address clearly on your race bib, or better yet, use a RoadID, which you can wear on your wrist or shoe. Bring a trash bag. A heavy-duty trash bag can provide a nice seat so you don’t have to plop down on wet grass. If it’s raining at the start, you can use the trash bag as a raincoat. Bring extra tissue. The only thing worse than waiting in a long porta potty line is getting to the front and realizing that there’s nothing to wipe with. Don’t overdress. It will probably be cool at the start, but don’t wear more clothing than you need. Dress for 20 degrees warmer than it is outside. 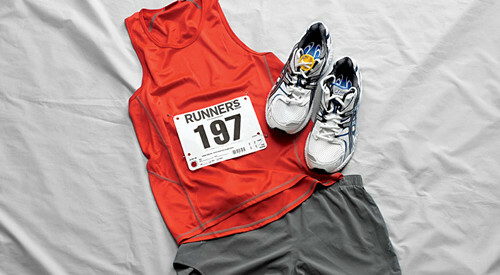 To stay warm at the start, you may want to bring (expendable) clothes that you can throw off after you warm up. Set at least two goals. Set one goal for a perfect race and another as a backup in case it’s hot, it’s windy, or it’s just not your day. If something makes your first goal impossible halfway through the race, you’ll need another goal to motivate you to finish strong. And it’s best to set a third goal that has nothing to do with your finishing time. This performance goal could be something like finishing, running up the hills rather than walking them, or eating the right foods at the right time and successfully avoiding GI distress! Fix it sooner, not later. If your shoelace is getting untied, or you start to chafe early in the race, take care of it before it becomes a real problem later in the race. Line up early. You don’t want to be rushing to the starting line, so don’t wait for the last call to get there. Start slow, and stay even. Run the first 10 percent of the race slower than you normally would, with the idea that you’ll finish strong. Don’t try to “bank” time by going out faster than your goal pace. If you do that, you risk burning out early. Try to keep an even pace throughout the race, and save your extra energy for the final stretch to the finish. Keep moving. Get your medal and keep walking for at least 10 minutes to fend off stiffness and gradually bring your heart rate back to its resting state. Be sure to do some postrace recovery stretches to stretch out your legs, back, and hips. Refuel. There are usually snacks at the finish line, but what the race provides may not sit well with you. To recover quickly, bring a snack with a combination of protein to rebuild muscles and healthy carbs to restock your energy stores. Consume it within 30 minutes of finishing the race. You might try a sports recovery drink, energy bar, or other packaged food that won’t spoil, spill, or get ruined in transit. Get warm. Change out of the clothes you ran in, and get into dry clothes as soon as possible. After you cross the finish line, your core temperature will start to drop fast, and keeping sweaty clothes on will make you cold. The next day, get going. As sore as you might feel the day after the race, it’s important to do some sort of nonimpact activity like swimming, cycling, or working out on the elliptical trainer. The movement will increase circulation to your sore muscles and help you bounce back sooner. Just keep the effort level easy.